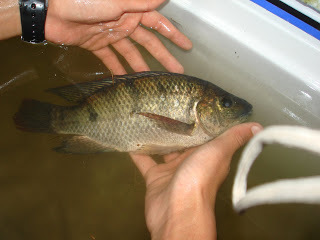 I have been growing Tilapia for some time. They are a fantastic fish species. I have only recently moved them to the farm, from where I kept them in the backyard in Walmer. I built a hot house for them, because they seem to do even better in warmer water. They survive in the wild in our region in the rivers and streams though; to I am not sure how much worse they would have done without the hothouse. At Pebblespring farm, I have now released the Grey Tilapia I had in to our far dam. Other I gave to my neighbour Richard who released them in his dam. Richards have been in the dam though the summer and winter and have done very well. I released them as fingerlings no larger than 5 centimetres and he has been fishing them out pan sized. My plan is to not fish any of ours out until next summer; giving them time to establish and grow our dam is a lot more alive with bulrushes, edge plants and duckweed, so I am expecting even better results that Richard has had. There are a whole lot a great things about Tilapia, once I start talking about them I tend to go on a bit. What I like most about them is that they are omnivores. In fact they can survive almost entirely of a vegetarian diet. They love to eat duckweed. Duckweed (Lemna) in itself is an amazing species. It is a flowering plant that floats in the surface of the water. Apparently it is the smallest of all the flowering plants. On a dam or pond it would look like a green carpet, but on closer inspection you will find that the carpet is not a mass at all, but rather a collection of little plants including leaves, roots and flowers. One little plant will comfortably fit on a fingertip. 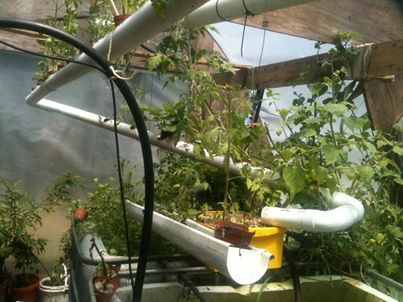 These fantastic plants can grow very quickly if the conditions in the water are right. It is not uncommon for them to double their population within a twenty four hour period. The best part of all is that they are a very good Tilapia feed, or chicken or pig or cattle feed. I have heard it said that duckweed has a higher protein content that Soya Beans and that it is eaten as salad of sorts in Vietnam or thereabouts. I have eaten a mouthful or two. It’s quite crunchy and fresh, but a little tasteless to my tongue. The next best thing about Tilapia is they taste great. I am a very fussy fish eater. We have caught too many great tasting fish in the ocean to be able to tolerate poor tasting fish. Tilapia is excellent, not at all muddy or mushy, but very good tasting. Other than that, they are on my favourite list because the species I grow (Orochromis Mossambicus) are indigenous to my province and because they tolerate a wide range of water quality and temperatures. Which brings me to my story here. Tilapia do well in tanks and they are easy for an amateur like myself to attempt to grow. But even Tilapia need the basics in place. They need Oxygen, then need filtration and they need food. In fact in that order of priority. I keep my Tilapia in 1kl tanks salvaged from Industry rubbish heaps in town. I have noticed that while they can go without food for some time, especially when the water temperature is low, they definitely cannot live very log without the water being oxygenated. They can survive a longer time with a filtration system broken down, but if the electricity goes down and the bubblers stop working you could have only a few hours before the fish start gulping on the surface then die. I have lost fish like this a number of times. It’s a risk that comes with keeping fish in high density tank environments. One of the ways to guard against disaster is not to have all the fish in the same tank, rather have two tanks, with two filtrations systems and two aeration systems. It then becomes less likely that disaster will befall both tanks. Even better have four tanks, or forty or four hundred. Even better have each tank with a different species or strains. Equip each tank with a separate power supply for the aeration and filtration system; because safety does not just come in numbers, it comes in variety. One hundred fish in a two kilolitre tank is not as good a two on kilolitre tanks with 50 fish each. By the extension of this logic, it is in fact much better to have the fish in a series of dams and ponds where there is a variety of temperatures, plant species, crustaceans, water depth and oxygen levels. Variety is what brings stability. Variety is what we strive for in Pebblespring farm. We are interested in different animal species, different plant species and different varieties of species. In this way when disaster strikes not everything is destroyed. The thing about disaster of course is it always strikes. Variety is the defence against disaster. Variety allows disaster to be a sculptor instead of an executioner. Variety allows the stronger, more appropriate varieties live, thrive and reproduce. This is why we have no interest in planting the whole farm, to mielies or sweet potatoes or geraniums. While monocropping may at first seem sensible, it is in fact high risk. It seems sensible, because you only need to run one set of machinery, one set of training to grow and harvest, one supplier of seed stock, one buyer of your output, one category of staff to labour on your fields. Or course we can see though that it also just need one category of insect to get out of control, one Seed Company to hike their prices or one buyer of your goods to undermine your prices. Suddenly monocultures seem very risky, and I am not just talking about farming, what I am talking about is the way we prepare ourselves to face the world. I am talking about how we educate ourselves, becoming highly specialised, becoming a “one trick pony”. All of the advice I ever here coming out of our schooling system advises that we become more and more specialised, more and more focused. More focus less variety. When we reach the top of the education pile we so highly regard that we referred to by a different name. We are now “Dr” Smith, no longer “Bob”, no longer “Mr Smith”. There is no similar incentive or encouragement to develop our lives in such a way as to nurture a range of skills, experience and passions. To be clear, I am not trying to introduce a new concept, I am perhaps rather trying to point out how far our modern urban system has wondered from the ideals of even classical Greece or Renaissance Europe. Leonardo da Vinci’s idea of the Renaissance Man was the idea of a life of variety spanning athleticism, scientific mindedness and artistic inclination. In our working lives, in our businesses, we are easily tempted to occupy a very small niche and to do only that thing. Bad idea! Not only is it boring to wake up every morning for the rest of your life to look forward to doing exactly the same thing, but it is counter-productive. The economy changes, it breathes in an out, sometime the economy wants beach towels, sometimes the economy wants raincoats. You and I must be flexible enough to move with this. Just because we are expert raincoat makers does not mean we “deserve” that it should rain. The universe does not understand the word “deserve” the farm does not understand the word “deserve”. The universe and the farm understand about variety though. This is the way it has always been. This is the way things are. All true. In nature, variety is the key to a healthy gene pool (plant and animal). So it should be with human existence.